Another fabulous find from eBay. You may remember from when I last bought a retro sideboard from eBay, that I have a penchant for naming furniture. 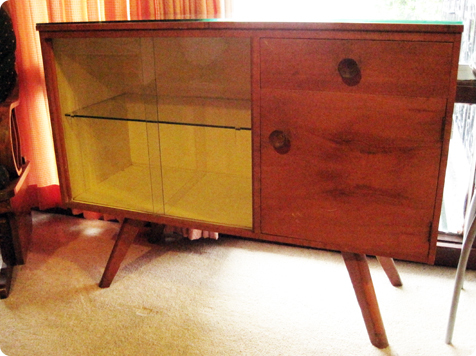 Well, not all furniture, just my two retro sideboards. My newest of these I have named Bettie after Bettie Page. Solid white oak, glass top and a glass shelf on the inside. There is also a cutlery drawer and another two shelves behind the door. Bettie was a gift from my Husbitect for our Wedding Anniversary. I have plans to line the cutlery draw with felt or perhaps velvet if that is more in keeping with the period? I haven’t completely decided what to keep in Bettie as yet, but I have put some of my kitschy and cute retro collectibles on the two main shelves. A new to me vintage blog that I think is totally faboo is ‘Into Vintage’. If you also love retro, vintage and kitsch, you’ll love this blog! Do you also collect retro things? Something else maybe – what do you collect? I’d love to know! Hmm, I don’t collect anything per se, I like Labrador things, green things, old knitting books, are they retro?? I love Bettie, and without googling was she a risqué model/actress type person??? I may have seen a doco about her on SBS. Your sideboard is delightful and so are the contents!! Cow: is it a milker??? The cow is a milker! I was after one for so long so I was very excited when I finally found one. 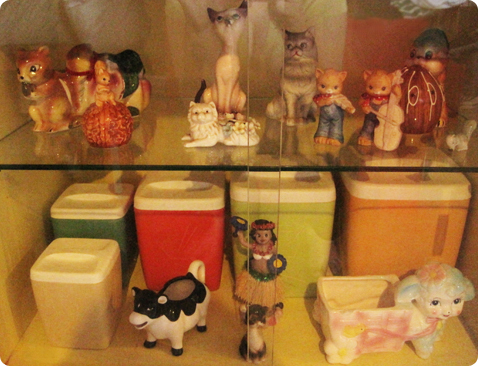 I cannot resist the cute/retro/kitsch (and maybe tacky! ).